I'd been thinking about trying diving for a long time when finally an opportunity presented itself in 1998. I was on a roadtrip with my dad and a couple of uncles and amongst other things, we went on a daytrip to Lady Musgrave Island on the Great Barrier Reef. On that trip, I did a half-hour introductory dive (with no qualifications) and it was awesome. The divemaster told me afterwards he rarely sees newbies who are so relaxed during their first dive! Then in Late August, early September 1998 I went to a 2 week holiday in Darwin to visit a good friend of mine, Glen, who was working there for a while. Darwin is the capital of Australia's Northern Territory, and is about 4 hours by plane from Brisbane. While there, I did a NAUI diving course with Coral Divers, which was absolutely brilliant! I very much enjoyed the course, which included several wreck dives to 18m depth, two drift dives over sandy coral gardens and a couple of training dives from the beach and in a natural rock hole. Since then I've been on a few dive-trips, the highlight so far was Indonesia. I've also done my Advanced Open Water course and a Wreck Specialty course. Unfortunately I haven't done any diving since moving to London apart from 2 short dives in Malta in 2005, as it's just too cold around here!! I suppose I should get my dry suit qualifications. 1998 - Darwin, Australia - various 1-day trips after my course. 1998 - Indonesia, Flores Island - 1 week dive trip with my class from Darwin. 2001-2002 - Brisbane - various 1-day and weekend trips. 2005 - Malta - 2 short dives with Divewise while on a work trip. 2014 - Great Barrier Reef - 1-week Mike Ball live-aboard dive trip near Cairns, Australia. 2015 - North Stradbroke Island, QLD - various boat dives. 2016 - Stradbroke Island, QLD - long weekend with Tatiana learning to dive. Just a summary of some of my dives so far..
Great Barrier reef - beginning of 1998, introductory dive. Berry Springs, NT - August 1998, training dive in freshwater to 5m. Vesteys Beach, Darwin, NT - August/September 1998, 2 training dives to 3m. 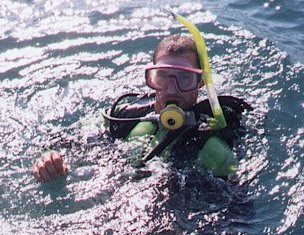 East Point, Darwin Harbour, NT - August 1998, drift dive to 12m. Karumba Schoals, Darwin Harbour, NT - September 1998, drift dive to 17m. 'Meigs' wreck, Darwin Harbour, NT - August/September 1998, 2 dives, both training, to 18m. 'Mona Loa' wreck, Darwin Harbour, NT - September 1998, training dive, to 18m. 'Song Saigon' wreck, Darwin Harbour, NT - September 1998, recreational dive to 24m.